Claire Benoit’s loyalties are divided as she struggles to prove herself to her pack and balance a normal teenage life as well. There is nothing more that Claire wants than to plan her dress, hair, and makeup for the Autumn Ball with her best friend, Emily, and have fun with her boyfriend, Matthew. But Claire has duties that she must perform at the next pack meeting; if she fails, she will become marked. Being a werewolf isn’t always easy for Claire, who has a stressful relationship with her mother, and cannot even confide in her best friend, Emily, about anything pertaining to her wolf side. If a human were ever to find out a werewolf’s secret, he or she would have to be killed. Matthew, Claire’s boyfriend, is the only one who knows, and even he cannot fully understand Claire’s wolf side. When Claire’s odd behavior compromises her deepest secret, she will be forced to do something she never thought herself capable of. 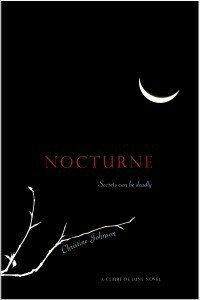 Nocturne is the second in a YA series by Christine Johnson, and is every bit as good as its predecessor, Claire de Lune. Nocturne focuses on Claire’s relationships with the humans surrounding her, and her continuing battles with her not so very maternal mother. Marie is a bit more palatable in this book, but I still feel for Claire, who is a very deep and caring person. It pains Claire that there is a part of herself that she can’t share with her best friend Emily, and because of her other self, Claire becomes withdrawn. Emily’s new friend Amy is a threat to Claire in more ways than one, and she is jealous of the ease of the friendship between Emily and Amy. Matthew disappointed me a little in this book. I wanted more from him. I don’t really get the whole point of a gardien, and it wasn’t really expanded upon in this book. Instead, Matthew and Claire have teenage relationship drama set against the backdrop of the Autumn Ball. In the end, Matthew does come through for her in a really big way when she faces a really hard decision. There’s one scene in Nocturne that I just can’t stop thinking about. I’m not sure if it’s a set up for the third book in the series or not, and if it were, I wish that Johnson had developed the no name character some more. I’m definitely a fan of this series, especially with the unique spin that only women are werewolves. I hope that the next book will return to Matthew’s father’s research, which was a large part of Claire de Lune.